“My mother says that when they took God out of the schools, the schools went to hell. She may be right." -- Clarence Thomas, 1985. The popular lament that ungrateful Americans kicked God out of their schools refers, usually obliquely, to a series of Supreme Court decisions made between 1947 and 1971. One in particular, Engel v. Vitale (1962) affirmed the opinion that even the most tepid religious exercise was impermissible in state-funded educational institutions. What Engel specifically forbade was the recitation of school prayer. More specifically, it forbade an unusually capacious prayer that the New York Regents had endorsed. Carefully composed to avoid giving offense, this slight, ecumenical petition ("Almighty God, we acknowledge our dependence upon Thee, and we beg Thy blessings upon us, our parents, our teachers and our country. Amen.") embodied the last constitutional redoubt of required religious exercise: "nonsectarianism." Of course, for much of American history, it was not prayer, but Bible reading in schools that tested the limits of state and national protections against religious establishment. If you ask "Which Bible?" you've asked a good question (the Catholic Bible? the Hebrew Bible? the Mormon Bible? One of several Protestant versions? ), and one that animated church-state controversy in the nineteenth century, along with the growing sentiment that nonsectarian religious exercise was neither nonsectarian nor religious. It's also the question that underlies Steven K. Green's excellent new study, The Bible, the School, and the Constitution: The Clash That Shaped Modern Church-State Doctrine. As Green suggests, a larger concern breathed behind the Bible issue: How, pray tell, did Americans expect to maintain religious practice in the schools amid the youthful brigades of Protestants, Catholics, and Jews that marched into class every morning? Leading nineteenth-century Protestants insisted that the rudiments of elementary religious (and by extension, the foundations of morality) could be communicated to these impressionable minds absent denominational bias if students were merely asked to read the King James translation of the Bible "without note or comment." Faces generally straight and fingers probably un-crossed, they argued that such an arrangement would both sustain faith and preserve morality--all without infringing on anyone's religious liberty. As the chapters progress, we find Green's jurists, policymakers, and commentators stumbling haphazardly, yet definitively, toward a secular, separationist reading of the First Amendment. Propelled by a robust combination of constitutional idealism and logical contradiction, nonsectarians inadvertently drove a wedge between church and state. The book's most salient historiographic contribution may be its rebuke to the increasingly resonant notion that nonsectarian public education was essentially anti-Catholic. 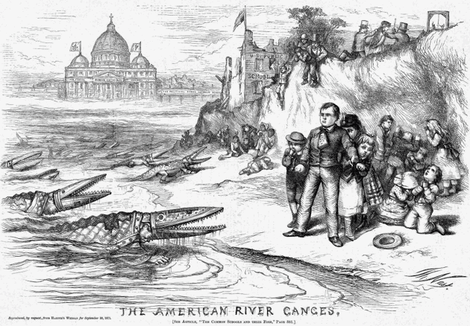 Anti-Catholicism accounts for some antebellum and postbellum separationist sentiment, he allows, but only some. Separation of church and state was often an object in and of itself. In other words, when it came to the central nineteenth-century controversy over church and state, leading Protestants were usually motivated by more than their disdain for popery. Was Bible reading inherently sectarian? Did its reading, even without note or comment, violate rights of conscience of religious dissenters? For that matter, were Catholics and other religious minorities entitled to equal regard by the government, one that many people still assumed was grounded on Protestant values? Should public education be secular, Protestant, or generically religious? Could public schools fulfill their mission of instilling morals without teaching religion? Did government have an obligation—or the underlying authority—to ensure the religious well-being of its citizenry? Did government have any role in religious matters? And if the Bible was excluded from the schools, would that action satiate Catholic claims for a share of the public school fund. Meanwhile, in Congress and the state legislatures, conservative Christians and liberal secularists proposed conflicting amendments that would have rendered constitutional provisions against establishment more precise and more prescriptive. Others, including the infamous Blaine Amendment, would have explicitly prohibited federal funding for sectarian institutions (and here, we're mainly talking about Catholic schools). Similar measures did pass at the state level, but there again, Green notes that they preceded the great blossoming of Catholic schools and would have impacted Protestant schools too. The cumulative effect of Green's magisterial work is to make clear just how much our modern debates over the relationship between church and state owe to nineteenth-century disputes over the Bible and the schools. Though constitutional justifications for nonsectarian public school religious exercise limped into the twentieth century, religious practices persisted with some vitality. In 1960, roughly 2 in 5 schools included Bible reading in 1960, while 1 in 3 included prayer. When the Supreme Court declared even the least exclusive of these practices unconstitutional, the beleaguered ideal of nonsectarian religious exercise finally expired and the lament of Clarence Thomas's mom, and many others, began.